THE GOOD - In this eclectic dramedy that’s clearly not for everyone, Brie Larson shines as Kit in a role uniquely placed to represent the struggle of staying true to yourself amidst the pressure to be like everyone else. Samuel L. Jackson clad in a glitter-fro is also a plus. ​​If Luna Lovegood were a muggle, she would be Brie Larson’s Kit. “Unicorn Store,” which was also directed by Larson, has been several years in the making - Larson’s directorial debut about a young woman who wants a unicorn as a pet finally found a home on Netflix this year. Brie Larson is not one to shy away from making bold moves and even bolder statements, as the controversy over her sentiments on “Captain Marvel” has shown. In a Hollywood where being a people pleaser for the audiences of the world is increasingly common, Larson’s unapologetic behavior in staying true to herself is a breath of fresh air. With this in mind, her alter ego in “Unicorn Store” has a lot to learn after getting kicked out of art school for being, quite literally, too colorful. “Unicorn Store” is a delightful, albeit at times slow, romp through self-discovery, and more importantly, self-love. The opening sequences of “Unicorn Store” are colorful and crisp - they let you know exactly what sort of whimsy you’re getting yourself into. Splattered paint and old video footage of Kit as a child playing make-believe and letting her creative colors fly lead into the present day, where Kit is now an art student at a prestigious school run by a man best known for putting “a stick in a box.” We quickly learn, however, that Kit’s technicolor lens is lacking in the eyes of the school, and she is forced to move home after failing out of the prestigious monochrome art institution. Kit is then tasked with becoming a “real adult” - getting a temp job at a PR firm and living in the basement of her loving (but completely clueless) parents. Kit starts to think she’s really living the good life, hiding her true desires for the desires of society, until she’s invited to The Store by Samuel L. Jackson’s The Salesman, who has convinced her she can have a unicorn IF she proves herself worthy to care for one. Therein begins Kit’s journey, and along the way, she finds much more than just the stuff of unicorns. Cinematography tells a lot about the character’s state of mind - for instance, Kit is often seen looking up at the world, instead of down at it. She’s unique, but not pretentious about it. She doesn’t think she’s better than anyone - indeed, she’s envious of the normality of those around her. She feels excluded, and more importantly, misunderstood. Her parents, Gene and Gladys - played by the charismatic and lovable Bradley Whitford and Joan Cusack, respectively - are counselors for an emotional support group called Emotion Quest, and for all the therapy they do with their young clients, they have a tough time getting to the truth with their own daughter. During a dinner scene with Kit’s parents and their prized and excruciatingly annoying pupil, Kevin (Karan Soni), Gladys says to Kit, “You are being weird on purpose.” This phrase is a great representation of how Kit feels the rest of the world views her - as though she’s trying to “fail” society’s standards on purpose. Although, to her credit, Kit’s new position a the PR agency is racked with mundane behaviors - the catty assistants, the subtly creepy boss, and old gray suits. 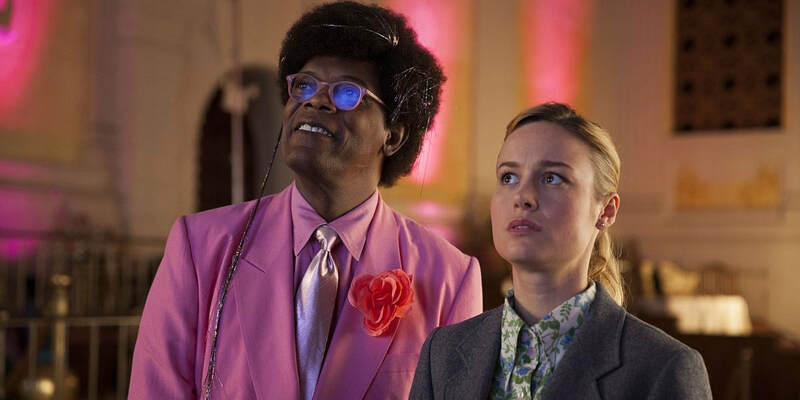 This is by far the slowest, and dullest, part of “Unicorn Store.” While necessary to develop the story, the audience came to see unicorns and Sam Jackson in pastel colored suits. It isn’t until Kit begins receiving invitations to an adventure we all wish we could go on that the script and the pacing begin to improve. The heart of this film blossoms once she’s introduced to The Store, and subsequently, to The Salesman. Indeed, Samuel L. Jackson as the fluorescently dressed and brightly emoted Salesman is a role we never knew we wanted for him, but have clearly always needed. He injects this character with the same directness and grit we see in many of his R-rated action thrillers, but with a sweet cherry on top. I know, it’s a weird combination, but it works. It also helps that Jackson and Larson have a lovely chemistry together, which is no surprise considering they’ve been working closely on back-to-back projects. Jackson delivers a spot-on performance which the audience can’t quite put their finger on in regards to his good (or eerie) nature. Between Jackson as The Salesman and Mamoudou Athie as Kit’s unlikely unicorn stable-building partner, Virgil, Brie Larson has shown that she knows her way around a casting room. Athie is the perfect balance to Larson’s eager and excitable Kit. Athie plays Virgil, Kit’s only real human friend, with empathy and rationality. He’s cool and collected, and always has an open ear. He’s the companion to show Kit that she doesn’t need to be accepted by society - she only needs to accept herself. That, after all, is the joy in “Unicorn Store.” It both is and is not about unicorns at all. I won’t give away any spoilers about whether or not we get to see a real unicorn, but I will say that we do get to see an overarching theme of the importance of rejecting the pressures society places on us to be mundane. While it may be hard to relate to the notion of wanting a unicorn as a pet or walking around with glitter on your feet and Care Bears in your closet, there is something very universal about “Unicorn Store,” and as Joan Cusack’s Gladys says near the film’s end - “The most grown-up thing you can do is fail at things you really care about.” I’d say we can all relate to that. “Unicorn Store” may be an acquired taste, but this is only due to the fact that it will challenge you to question who you’re really living for... if the answer isn’t “you,” then it’s time you start prepping for your unicorn.